Garden Street sits at right angles to Well Street and is the older of these two terraces. There are 11 years between the two, Garden Street with a date stone of 1886and Well Street dated 1897 (year of Queen Victoria’s Diamond Jubilee). Looking at the street more closely from left to right, the corner turns on the diagonal towards no’s 82 and 80. Note the drop in the ridge to follow the fall of the ground. No’s 78, 76, 74 and 72 Garden Street. I would be really interested to know what happened to the rest of the numbers on Garden Street, numbers 1- 56. If you have any recollections of this street, please do get in touch! I would love this to become a living history archive. If you live near Newcastle, why not call in for a coffee at Bellinis in Pepper Street? There are some of my framed prints of local streets on display and available to buy or order. 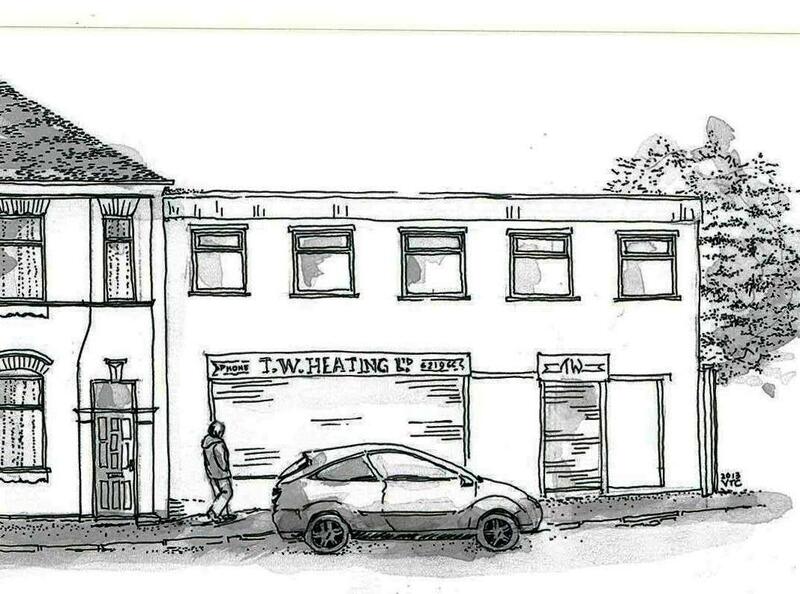 Image | This entry was posted in architecture, building conservation, drawing, Newcastle-under-Lyme history, Victorian Architecture and tagged architecture, conservation area, Garden Street, history, newcastle-under-Lyme, Pen and ink wash, TW Heating. Bookmark the permalink.